Prepare to be wowed as you watch Donna's interview video and see her transformation pictures. 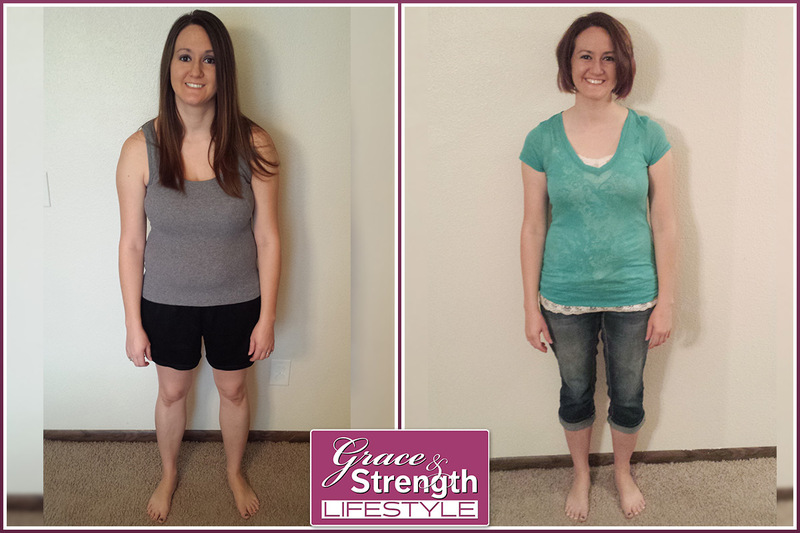 Donna lost over 100 pounds with the Grace and Strength Lifestyle's Christian Weight Loss Program. * Her enthusiasm, happiness, and joy are overflowing as she talks about the changes in her life through this remarkable journey. You will be inspired by watching this video! Way to go Donna! Auburn's story is unique in a couple of ways. First of all, she is addressing her health at a younger age than many of our clients, and secondly she had a relatively very small amount of weight to lose when compared to a lot of the stories you'll see that we share. In fact, most people will readily admit that she probably didn't 'need' to lose any weight at all, and a lot of us would be very happy ending up where she started. No More Hiding - A Christian Weight Loss Journey: In today's post, you'll see pictures and a video interview with Jess as she reaches her goal weight with the Grace and Strength Lifestyle program. Her transparent and open discussion about hiding food, hiding habits, and even hiding herself provide a poignant and powerful glimpse into the deep impact our relationship with food has in our lives. Tami's Story - At the start of the Journey program my main intentions were to lose weight and hopefully get my pre-pregnancy body back. After having twins I was never able to lose that extra weight and then after having a third, I didn't know what I was going to do. I would try to watch what I ate, exercise here and there, but nothing was successful and I never stuck with it very long. Then I kept seeing a friend of mine, a G & S coach, Jillynn keep posting things about G & S on Facebook. Bonny's Transformation Story - In her own words: It took two years, several emails, a webinar, three phone calls, and a black Friday special for me to finally sign up for Grace & Strength. But through it all, God was preparing me for the journey He would take me on through Grace & Strength.